Kathryn "Klew" Williams, an MS candidate in Interactive Media and Game Development (IMGD), never knew the coding behind game design would fuel her growth as both an artist and as a scientist. 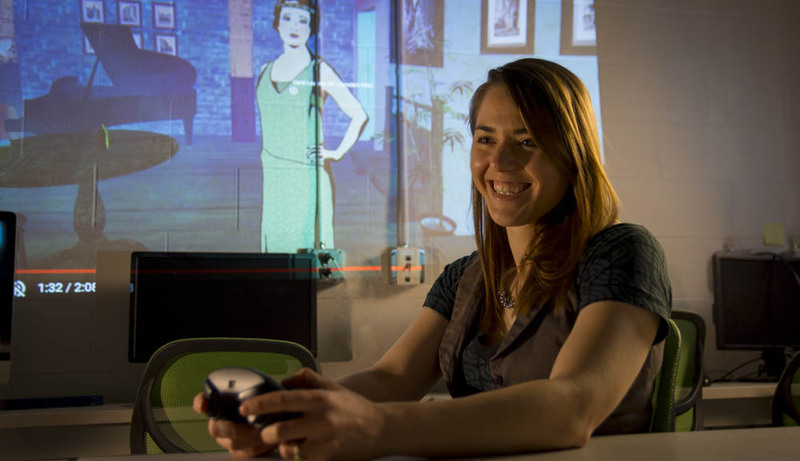 Kathryn "Klew" Williams combines artistic freedom with the specific science of coding to create video games that resonate with players’ real life experiences. Why did you pick the branch of science you are in? My undergraduate degree was in Studio Art – Drawing and Painting. I wanted something rigorous and technical, but that would allow me to grow as an artist as well. That’s a rare thing, but I found it with the IMGD program at WPI. I was very lucky they brought me on. I have always been a gamer, and I’ve always been fascinated with associated art movements like net.art, glitch, and the demoscene. So this was a natural progression of my interests and my training. What are the biggest misperceptions people have about scientists? That there is little or no overlap with creativity, craft, or artistry. There is! Depending on the discipline it’s a little (chemistry) or a lot (IMGD) but they are definitely not mutually exclusive. What’s something you do that reminds you that you are an #ActualLivingScientist? Getting an infinite loop bug in my script at 2:30 in the morning is a nice reminder. But in all seriousness, there is a lot of experimentation and observation in IMGD. The scientific process isn’t executed as such: we don’t really hypothesize, we don’t always repeat our experiments, and we don’t have controls. But there are aspects of science in IMGD, very much so on the CS side of things. When something goes wrong it’s no accident. There is always a reason something works the way it does. It could be the wildest, strangest bug: my characters arms grow 300 feet long when I jump! But there’s a reason that’s happening, it’s in the code. There’s always a discrete root cause. How do you hope your scientific contributions will impact the world? In my case the science is the craft that can bring my art, my message, or my experience to an audience. For example, Rachel Burton and I just recently finished a game jam (like a hackathon) game called Love, Thy Neighbor for #ResistJam: https://klew.itch.io/love-thy-neighbor. The theme of the jam was to resist authoritarianism in all its forms. The game itself is an old-school text adventure written in Inform 7, which is based on very, very old tech and is a very strange coding language to say the least. One of the lines of “code” I wrote was, direct quote, “A thing may be distant or near. A thing is usually near.” That’s code! Inform 7 is an English parsing language that uses a parser for the code interface as well, so it’s almost natural language. That line of code defines a boolean (with “or”) for a specific class (“thing”) and names the boolean values (“near” and “distant”) so they can be accessed with natural language by the player. It also sets up a default value. So it’s quite scientific if you look closely. The game is about growing up queer in a small town and the story is drawn from Rachel’s and my personal experiences. We’re proud to show it because we think it will resonate with some people like it resonates with us. How has WPI prepared you to become an #ActualLivingScientist? IMGD has enabled me to do so much. This was my second year speaking/presenting as part of GDC (Game Developers Conference, in San Francisco) and my second year showing a game at the WPI booth at PAX East, the huge video game convention in Boston. I spoke at SWPACA in Albuquerque and I’ll speak at QGCon in LA in April. Without the program and without the support of my graduate research advisor (Alex Agloro), I wouldn’t have these opportunities to speak about my work and hear about the work others are doing around the U.S. and around the world. It’s been an incredible two years.